9-year-old Marcus Atkinson isn’t really all that interested in sport. Unfortunately, his self-help guru dad is convinced that Marcus is a sporting star – he just hasn’t found the right sport yet. Young readers will be laughing out loud as Marcus tries to convince his Dad that he will never be a Super Swimmer. He tries his best, but he just doesn't seem to be able to do anything well - diving, polo, backstroke, butterfly or freestyle. Will he ever be able to achieve anything in the pool? The Diary Of… series shares an amazing amount of information about each sport in the sparse, largely comic-book style text and illustrations. Filled with dramatic exaggerations inspired by Marcus’ vivid imagination, readers will also learn about different swimming strokes, diving and some pool and water safety information. 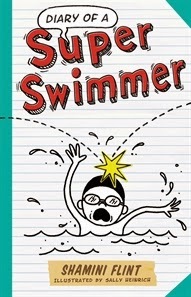 Diary of a Super Swimmer and the other books in the series are fantastic for young readers just moving into their first chapter books and for reluctant readers, especially boys.